A gathering in New Jersey for the journal Others in 1916. 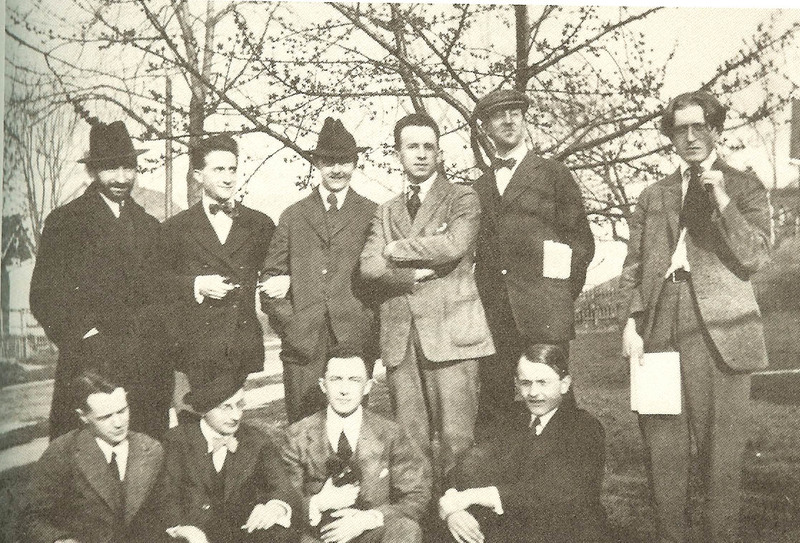 Alfred Kreymborg, front row, second from the left, in front of Marcel Duchamp & left of WCW (holding cat). Maxwell Bodenheim on the far right. One day last year, I was driving in the rain through southern Chester County when I happened to pass Baldwin’s Book Barn, one of the quirkier book establishments hereabouts. While Baldwin’s is on the web these days, it appears in situ to have largely managed not only to have ignored the digital age, but even the world after the Second World War, when paperbacks took over publishing.¹ The Book Barn claims to have 200,000 books somewhat anarchically shelved in its rambling establishment, perhaps 99% of which are hard cover. I always need the map they hand out at the counter to find my way to the poetry section & this time returned with a signed copy of Alfred Kreymborg’s The Little World: 1914 and After, published by Coward McCann in 1932 for the price of a paperback. In 1932, Kreymborg would have been 49, publishing for over 20 years & widely known as an editor with some serious (if waning) avant-garde cred. The first literary figure to become a regular at Alfred Stieglitz’ 291 gallery, Kreymborg and Man Ray brought out a magazine called The Glebe in 1913 & ’14, the fifth issue of which was Ezra Pound’s anthology of Des Imagistes. While the younger Man Ray (the imaginatively reinvented Emmanuel Radnitzky of New Jersey) went on to establish himself primarily as a visual artist in Paris, Kreymborg stayed literary, editing a series of magazines and anthologies. Two years prior to The Little World, Coward McCann had published Kreymborg’s Lyric America: An Anthology of American Poetry (1630 – 1930), which, while aimed at the general reader, included not one, but three sections of its final age cohort of poets, those born from the mid-1880s & after, one large one focused on modernists (Amy Lowell, Sandburg, Sherwood Anderson, Lola Ridge, Pound, H.D., Williams, Walter Conrad Arensberg, Stevens, Loy, Moore, Hartley, Cummings, Eliot & even Haniel Long among others now forgotten), the second focused on formalists (DuBose Heyward, Aiken, Ransom, Allen Tate, Merrill Moore, Robert Penn Warren & George Dillon, but also Paul Laurence Dunbar, James Weldon Johnson, Fenton Johnson, Claude McKay, Jean Toomer, Langston Hughes & Countee Cullen²) & finally a third group of more eclectic or relaxed quietists³ (MacLeish, Tristram Coffin, Dorothy Parker, Mark Van Doren, Robert Silliman Hillyer, Edmund Wilson, Malcolm Cowley, Stephen Vincent Benét, Babette Deutsch, Louise Bogan, Kenneth Fearing, Horace Gregory, Stanley Kunitz, Stanley Burnshaw &, last but not least, Hart Crane), hybridism avant la lettre. The work I’d seen of Kreymborg’s earlier anthologies, mostly compilations of poetry published in his journal Others, had led me to pigeonhole him as a later, lesser imagist, although already by the 1930 anthology Kreymborg’s selection of his work own suggests a gradual move away from the modernist group – where he positioned his work in Lyric America – toward the third tendency. By the end of his career, Kreymborg was giving readings accompanying himself on the mandolute, a larger version of the mandolin, anticipating by a few decades Robert Bly’s similarly folksy performance style. I wasn’t prepared for the work that forms the dominant strain of The Little World, political doggerel – think of deadline poet Calvin Trillin – presented in imagist format. The journal lists Trillin as a “verse columnist,” keeping him at arm’s length from the journal’s books & art section. Poussin did not eat baloney. It’s a reminder of the degree to which much of what is new, or at least newish, really just reswizzles what already came before. Kreymborg’s name might not have lasted, but he was not unsuccessful at the time. Many of the poems previously appeared in a number of journals including The New Yorker and Vanity Fair, as well as The Bookman, Opinion and The New Masses. Where he differs most from Trillin, save for the imagist look to it all, is in Kreymborg’s general preference in his satire to skewer categories more often than individuals, for example. who wear the same face. What is perhaps most alarming about this second poem is the self-satisfied way in which Kreymborg presumes he’s taking the progressive point of view. Prosodically, he does not have a longer first line ending on an a, one of his standard ways of setting up what comes next for greater emphasis, so he’s actually muting the N word, but only because he wants the shock to be the last term of the third line. Then he presumes a world in which interracial affection might just be normal, but confines that universe to the American south. Is that a homophobic swipe at H.D.’s relationship with Bryher there? It could be read that way, just as it might be a comment on her grecophile poetics. My sense is that Kreymborg’s pleasure lies in being able to do both at the same time. Of the folks who have largely receded into the mists among Kreymborg’s targets, the only connection I can see is some vague connection to me: distant coz Randolph Silliman Bourne & equally distant in-law DuBose Heyward are among the few folks here you’ll most likely have to look up. While none of this could be characterized as deep, it’s not that hard envisioning these miniature puzzles as a feature in a publication not too dissimilar from the Poetry Project Newsletter (imagine Jim Behrle or Gary Sullivan or Kent Johnson doing the writing) or Poets & Writers. Or on Harriet, the blog. Plus ça change indeed. The principle reason I can see for reading Kreymborg now is to remind oneself of how he intersects with a couple of different modes of minimalism: the satirical epigram and Imagism’s free-verse lyric. It serves also to remind one that Calvin Trillin really is not outside the circle of poetry, even if the editors of The Nation stick his ditties up at the front of the book, so to speak, and that his relationship to such disparate writers as Billy Collins, Charles Bernstein & Kent Johnson would be worth exploring. Over the next couple of weeks, I want to take a look at a couple of other kinds of minimalism, including that which extends from Imagism & the seminal work of Larry Eigner, and even haiku. ¹Indeed, the first claim to fame of San Francisco’s City Lights wasn’t that it was home to co-owner Lawrence Ferlinghetti & a hangout for the Beat poets, but that it was the first bookstore in the US to focus almost exclusively on paperback books. ²I wonder if this is not only the first anthology to segregate progressive poets from quietists, but also to explicitly include the major African-American poets of the period with the most conservative literary faction. ³One might read them as direct ancestors to the kind of poetics later concentrated in the writing program at Iowa City, at least prior to 1990.